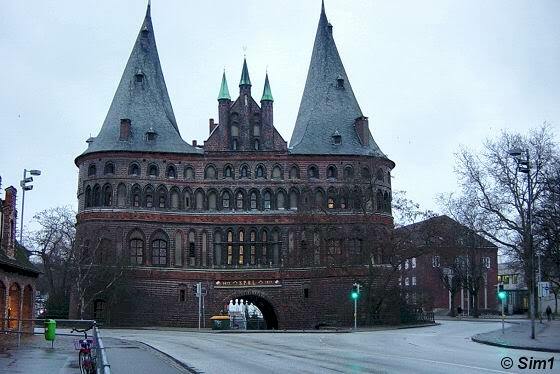 Lübeck is a Hanseatic city that was added to the Unesco World cultural heritage site in 1987. The city was bombed in 1942 and in the medieval town centre there were nearly 1000 houses destroyed and five of the seven church towers. In total about a fifth of the city was destroyed. 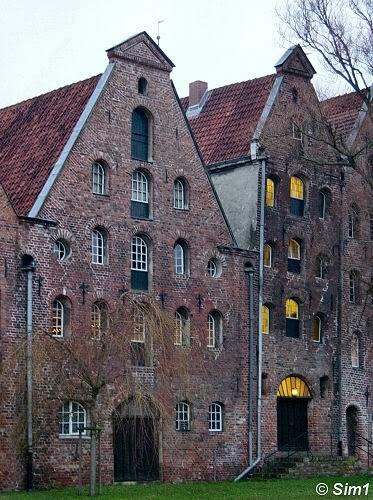 But luckely Lübeck has since that day restored the valuable old buildings, making it an attractive old town again. You can still sense that the city has been partly destroyed. There are areas of newer buildings mixed with the old ones. This to me didn't make the city feel 'cosy', as I would expect from a historic city. But it was great to discover the old historic building inbetween the new. On this page I want to give you an impression of my visit to Lübeck. I hope you will enjoy reading it! I started off the day really early; I left home around 4 in the morning to catch my plane from Stockholm to Lübeck at 7 o'clock. That was great though, as that meant I would arrive in Lübeck really early and I had a full to stroll around and enjoy the sights. This picture was taken early morning (around 9) and it wasn't that light outside yet; partly because of the dreary weather and partly because of the time of the day. I visited Lübeck in the middle of December, so the days are rather short and dark, hahaha, although it's not as bad as in Sweden. I walked from the city centre towards the Holstentor and I was right away taken by seeing all the different gables on the houses. Of course I started taking some pictures right away. 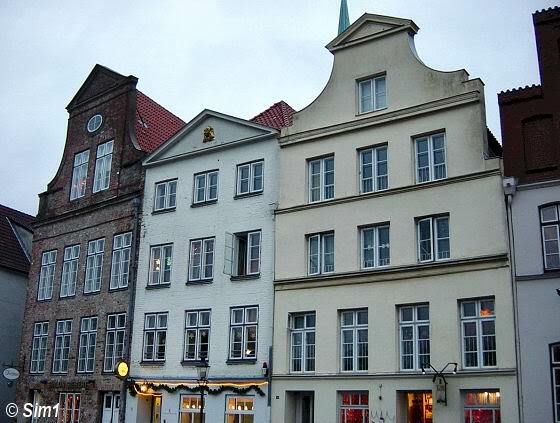 These houses are at the 'An der Obertrave' street and you can see several shapes of gables on the houses. I've seen more beautiful houses after that, but the bad weather didn't make me that enthusiastic to keep on clicking my camera. 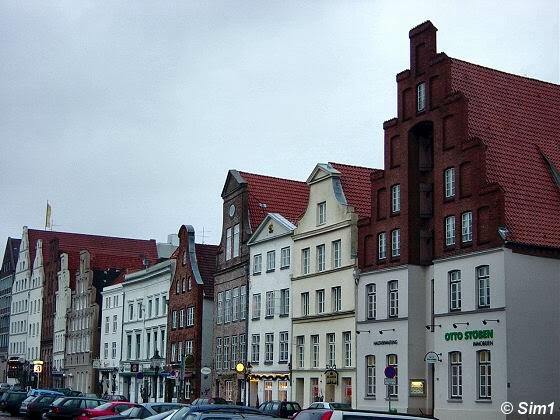 But this gives you a bit of an impression what Lübeck looks like. I really loved seeing these houses, they are the Salzspeicher or in English : the Salt storehouses. While walking along the canal at the 'An der Obertrave' street, I could see the Salzspeicher on the other side of the water. They really looked great from here and I would say you have the best view on them from this side. The salt storehouses are located next to the Holsten Gate (see later tip) and that makes them really easy to find. The Salzspeicher (salt storehouses) are from the 16th to 18th century. 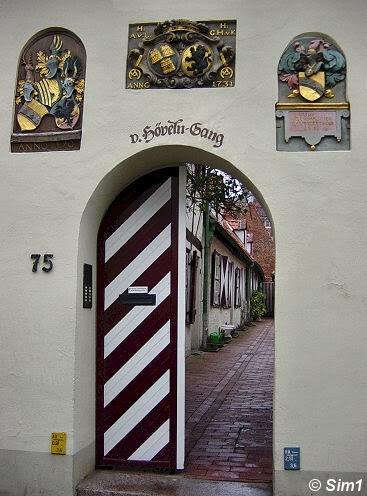 They were used to store the salt, or also called "white gold", that was brought to Lübeck from Lüneburg. From the salt storehouses it was transported on to Scandinavia. The salt was important as it was used to preserve food. 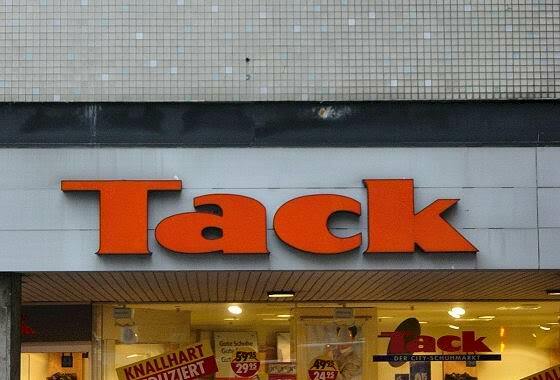 These days the Salzspeicher have a totally different function; they are now in use as a fashion store. 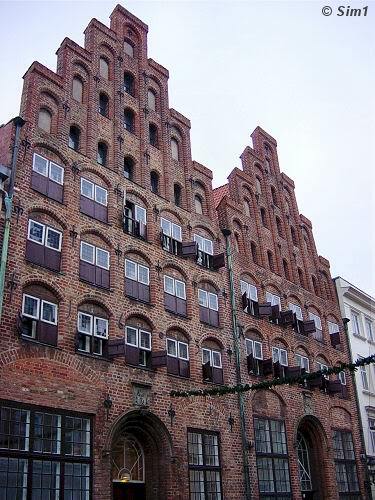 The Holstentor is probably the most well-known building in Lübeck as it is used as a symbol for the city. It also used to be on the 50 DM bills before the Euro came. This fortified gate is from the 15th century, with up to 3.50 meters thick walls. Once it was a bridgehead before the city. It used to have 30 cannons, although there was never fired a shot from them. The gate is located a bit weird nowadays as a busy road goes on either side of the gate. But it is still worth while taking a look at. When I walked around the gate it amazed me how crooked it is. The whole gate leans down on one side, and it sank over half a meter into the ground since it was build. This is caused by the fact that the gate was built on moor land and peat and with those thick walls the gate is obviously a very heavy structure. When you walk to the backside of the Holstentor, you will have a view not only over the gate but also over the rest of the old city centre. 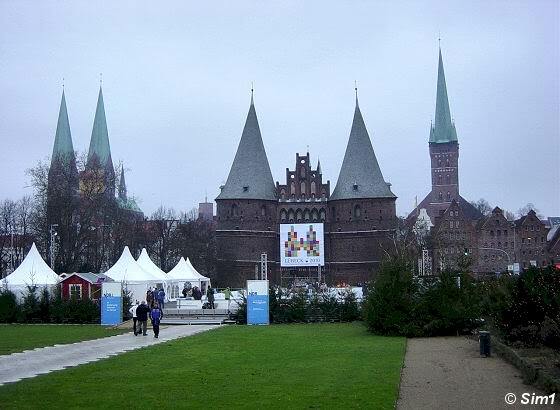 You can see the many pointy towers of the Holstentor and the churches of Lübeck. Inside the Holstentor is a museum. I didn't go here, so I can't tell you much about it, but this website might help you out a bit if you plan on going here : http://www.luebeck.de/kultur_bildung/museen/holstentor/. 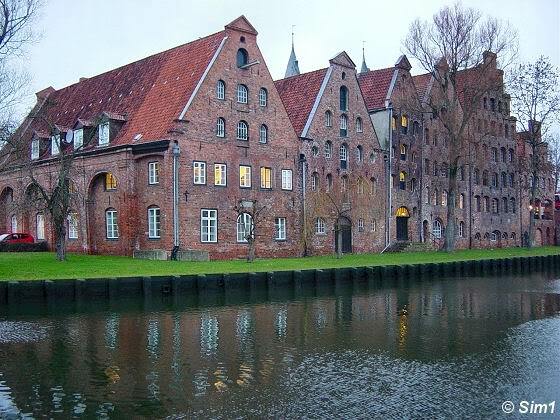 The Museum shows exhibits on Lübeck's early history, urban development and shipping industry. 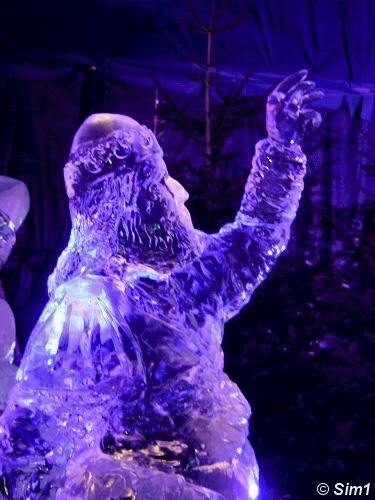 During my visit to Lübeck I was in luck that the event 'Ice World' was being held. 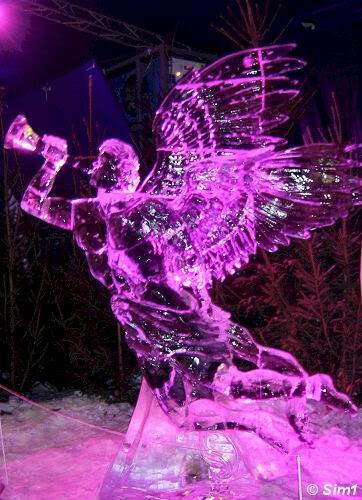 I had seen ice- and snow sculptures on pictures before, and I always wanted to go to a thing like this for myself. So this was a great opportunity for me to go and take a look at Ice World. The great thing about it is that you can see ice AND snow sculptures, or in this case even a sculpture that combines the two. 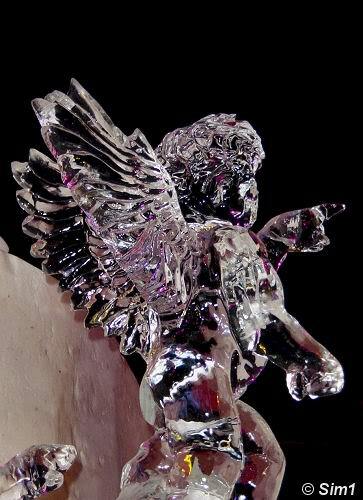 I was amazed by how much detail there was in the sculptures and the great effect by using the combination of ice and snow. 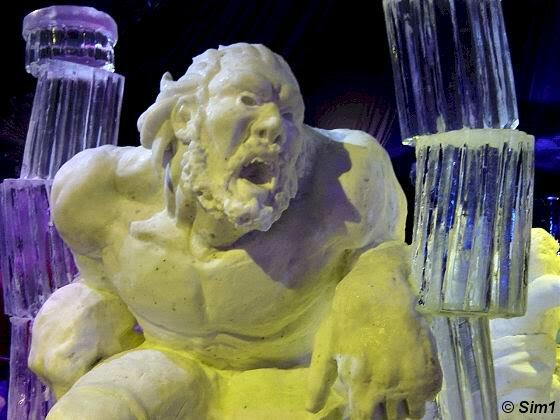 All the sculptures at Ice World were in a theme "The Bible - Stories from the Old and the New Testament". Taking pictures at Ice World is allowed, but it isn't all that easy as it looks. It was great to try some things out though.... hahaha, until my hands started to freeze! It was at least about -10 Celsius inside and after a while you really start to notice that; especially as I wasn't dressed for such cold weather. Outside it was dreary weather and +5 Celsius, and the cold is quite a shock when you get inside the tent. Besides freezing fingers the bright spotlights might create a problem. Sometimes it was too dark to take a picture and sometimes you get the spotlight right in your camera which makes taking pictures impossible as well. The different colours of lights can have some cool effects though as you can see in this photo. What I really loved about Lübeck was discovering the many little alleyways with lots of old houses. They look so picturesque, although the dreary weather did take away part of the fun of it. In this case this isn't just an alleyway. On the corner of the 'Kleine Petergrube' five historic half-timbered houses have been connected to form the Puppet Theatre Museum. This is one of the world's largest collections of puppets, stages, props, graphics, posters and barrel organs from the past three centuries from all corners of the world. I haven't visited the museum myself, so I can't tell you anything more about it. I just found the street so picturesque that I wanted a photo of it. For more info please check their website: Puppet Theatre. (the website is in German). As it was just a few days before Christmas when I was in Lübeck, there was of course a Christmas market in the city centre. Hahaha, the only strange thing is that I didn't take a picture of it! This is on the corner of the Marienkirche (St.Mary's Church) pointing my camera not towards the Christmas market, but in the opposite direction, lol. In the distance you can see the Jakobikirche. 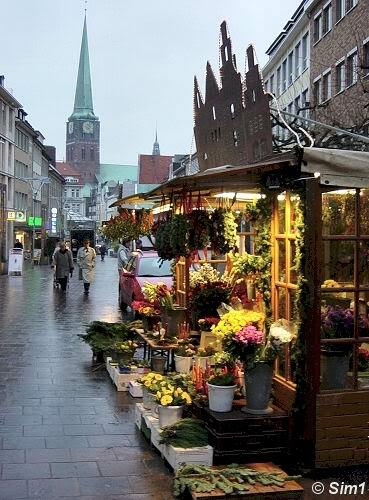 The Christmas market in Lübeck is an event of several weeks. This year (2003) it was held from 24th of November to 22nd of December. I always love to visit churches during my travels, so that's what I did in Lübeck as well. The first visit I made was to the Dom. 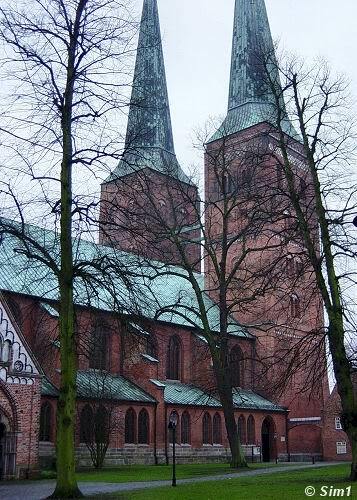 The Romanesque Cathedral is probably Lübeck's oldest architectural monument. They started building the cathedral in 1173, but a wooden church had been built on the same location before. Unfortunately the cathedral suffered severe destruction during the air raids in 1942. It took until 1960 before they started reconstructing the cathedral again (after St.Mary's church was rebuilt). Everything in Lübeck seemed to be in the Christmas mood and so was the cathedral. When I entered the Cathedral I was greeted by the sound of children singing Christmas songs. 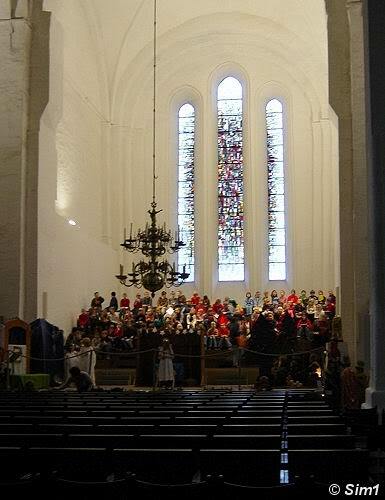 It was a large group of them, as you can see in the picture, busy rehearsing their songs and Christmas play. The huge windows gave a lot of light to this part of the church as did the spotlights. But in the area where I am standing it was dark. There were no lights on at all inside the cathedral; the children's choir was the only bright area around. 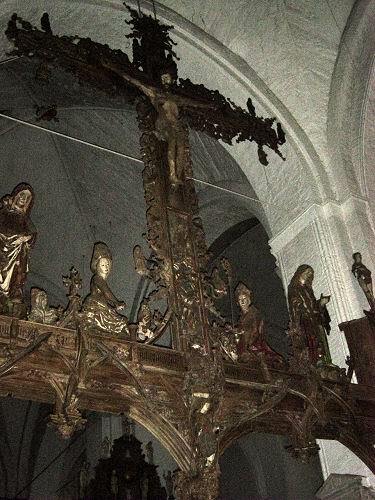 The cathedral has several works of art, but the most interesting possession is the 17 meter tall Triumphal Cross by Bernt Notke (1477). The Cross is made from a 17 meter (55 feet) high oak tree. The one bad thing is that they didn't have any lights on inside the cathedral, so everything was rather dark. I found that so disappointing! It was hard to take a look at the works of art because of this and that ruined the pleasure of visiting the cathedral quite a bit. I can't figure out why they didn't try to bring a bit of light inside! At the picture you can see how bad it was. The figures on the triumphal Cross are huge, but barely visible in this light. But even in the dark it looked impressive. I only wished I could have seen it a little bit better. 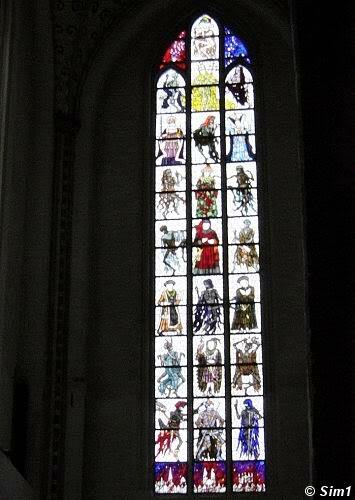 Some works of art were more visible when they caught some light from the windows, like this one for instance. No wonder maybe, with all that gold glitter, that it is able to catch some light and look bright and beautiful even in a dark cathedral. Next to the Triumphal Cross you can see the astronomical clock, high above an archway. It was a bit closer to the windows, so it caught some more light than the Triumphal Cross itself. The astronomical clock was added to the Cathedral in 1625 and is still running with its original works. Maybe not so clear in the picture but the clock is quite huge and wonderful to see. It's time visit the next church: the Marienkirche (St.Mary's Church). 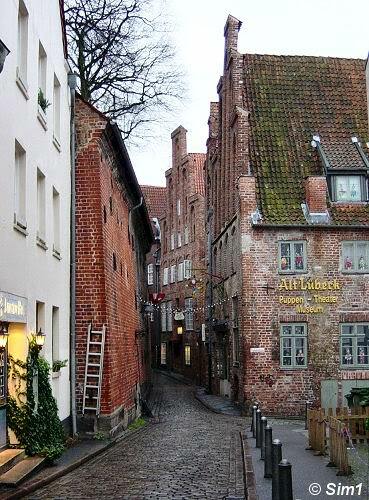 The old city centre of Lübeck is quite small and everything is easily reachable on foot. So walking from the Dom to the Marienkirche is a nice little stroll to make. In the picture you can see the building that is right behind the Marienkirche on the corner of the Mengstrasse and Breite Strasse. 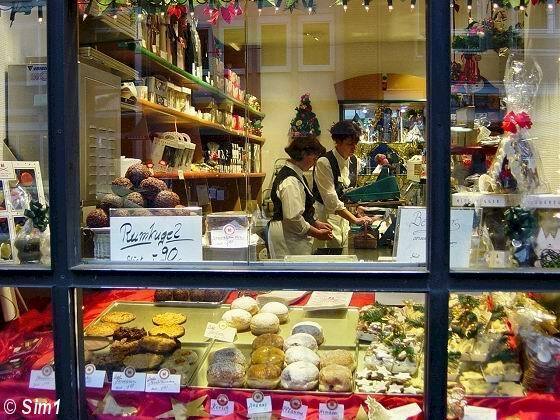 When you are here don't forget to take a look at the other side of the street where you can see the beautiful Buddenbrookhaus at Mengstrasse 4. Further on in the Breite Strasse you have to take a look at the Rathaus, Germany's most famous brick town hall, dating back to 1226. It's beautiful! I didn't take a picture of it as part of the Christmas market was located in front it and obstructed the view of this beautiful town hall. 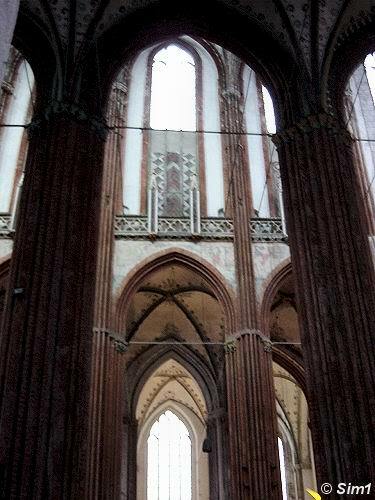 This is a picture of the inside the Marienkirche (St.Mary's Church). The church was built between 1226 and 1350. When you get inside you will be overwhelmed by the huge size of it. The 80 metres long centre nave rises 40 metres and is divided into two arcaded storeys. The ceiling and arches are decorated with floral ornaments. You can visit the church daily from 9 am to 5 pm (in the winter to 3 pm). Like the Dom the Marienkirche was also badly damaged during WWII. These bells are a remembrance of that. 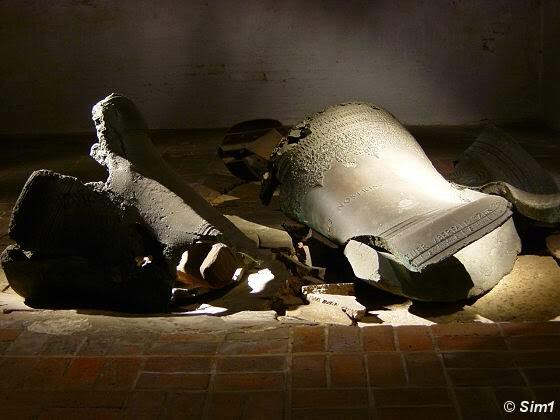 These bells were shattered when they crashed through the stone floor during a bombing raid. The bells have been left where they fell as a memorial. 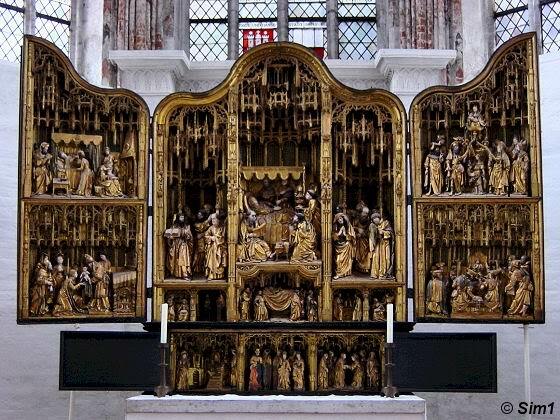 Behind the choir, in the "Marientidenkapelle", you can see a late Gothic altar from the early 1500's made in Antwerpen. 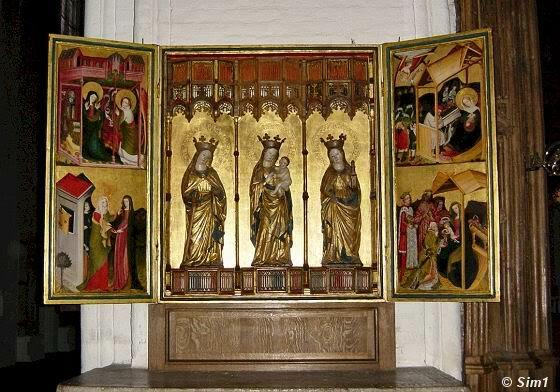 The altar is beautiful and it contains carvings portraying scenes from the life of Mary. I loved the old artefacts in the Marienkirche. But that is not the only thing that you can see here. The church is actually a weird mixture between old and new styles. I am not sure if that really could please me that much. I like to see churches in their original state, without adding too many modern elements. Sometimes this mix does work, and sometimes it doesn't. For me in this case it wasn't a huge success. But that doesn't take away that I did love certain elements to be seen in this huge church. 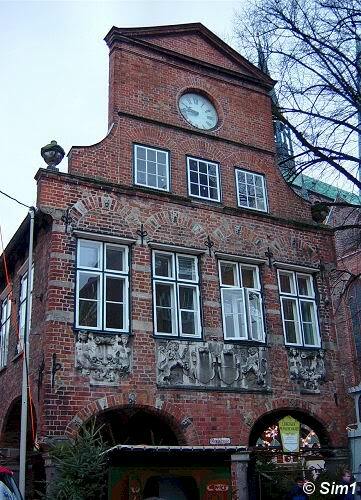 And if you are in Lübeck you certainly have to take a look inside. The sheer size of it alone will impress you. 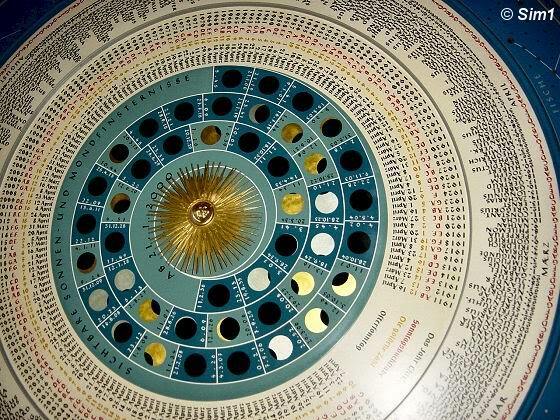 The astronomical clock in the Marienkirche fascinated me. I've been looking at it for quite a while trying to figure out all its meanings and how it works. Hahaha, of course I didn't succeed, there is too much to see and too many details. So I got the brochure instead to get some help to understand the clock. 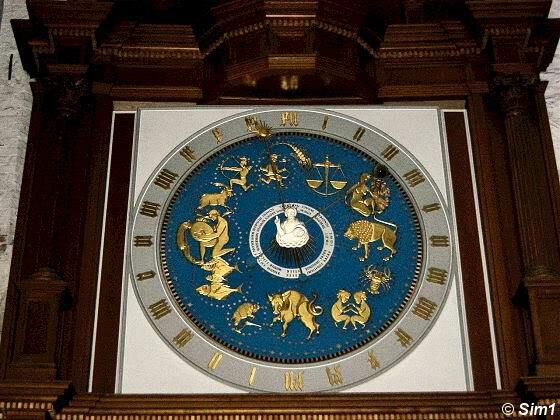 The original clock was destroyed, and today's astronomical clock comes from the local clockmaker Paul Behrens. It is made after a copy of the original. In this picture you can see only half of the astronomical clock, the top part. 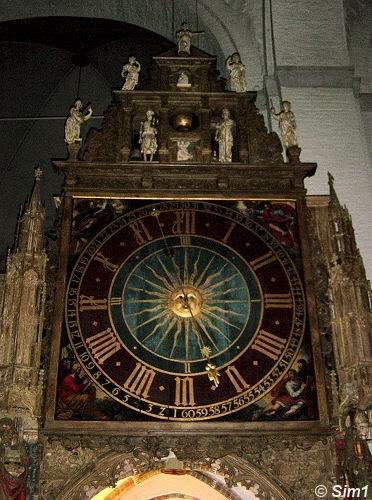 The whole clock is huge and it is almost impossible to miss it when you visit the Marienkirche. In this picture you can see the bottom part of the astronomical clock. There is so much information to be found on here, it takes a while to figure it all out. I won't bore you with all that though, hahaha, if you are interested you should take a look for yourself. Of course you can find out which date it is today and which day of the week. 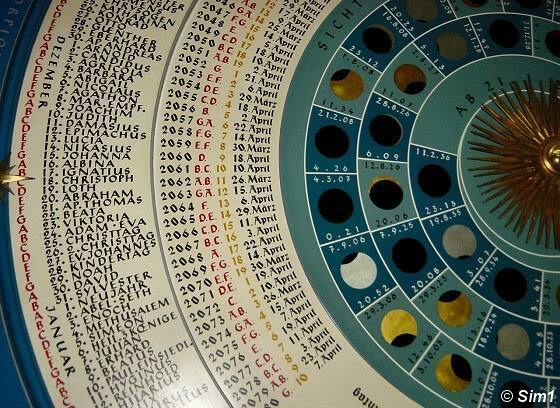 But also on which day Easter Sunday will be between the years 1911 to 2080 and all you would like to know about the moon phases. This is one of the two stain glassed windows that are a reminder of a painting that used to be in the church called 'Dance of Death'. The original Dance of Death was painted during the plague years around 1463. The original painting had been reconstructed once, disappeared, but there was always a painting after the original in the Marienkirche. But In 1942 Lübeck was bombarded and the painting was destroyed. As you could read before, there was much more damage to the church (and the city) than only this painting. The painting wasn't reconstructed in the original way, but now a new kind of Dance of Death was created in the form of these two large stained-glass windows. It was made between 1952 and 1956 by Alfred Mahlau. The inspiration of the work was this time not the medieval plagues but the world wars. Although they are a bit creepy, the windows are worth having a look at. 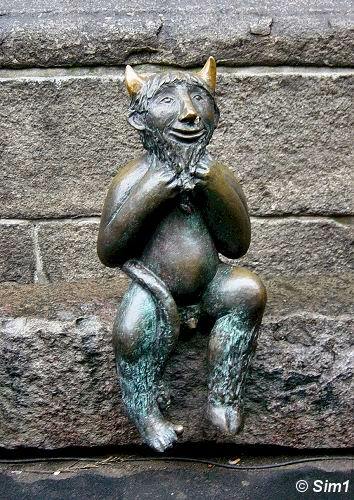 Outside the Marienkirche I saw this little devil statue. It was sitting on a little ledge, close to the ground, with its back against the wall of the church. I thought this little devil statue looks cute, but there is also a fun little story that goes together with this statue. The German word for devil is 'Teufel' and there is and the legend is about the 'Teufelstein' (devils stone). When the church was built, according to the legend, the devil was tricked into helping because he was told it was actually going to be a great beer hall. But when he found out the truth and that he had been deceived, he knocked a few of the church's great stones to the ground... the Teufelstein, or devilstone. 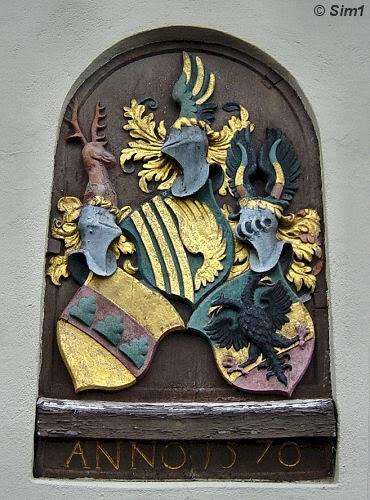 This is a close-up of the coat of arms in the wall on the left side of the door. When you click on to enlarge the picture you can see the date of 1570. 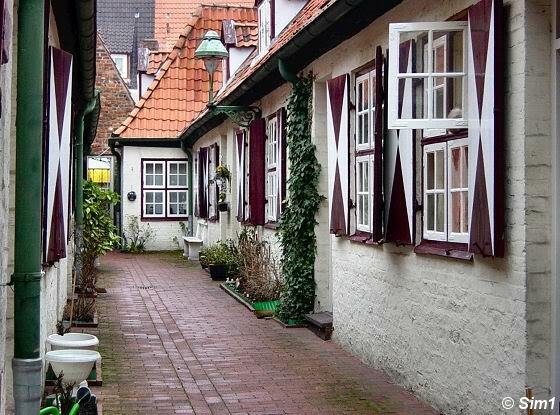 The Höveln Alleway was designated to become an almshouse in 1481 when it was owned by councilmen Tidemann Evinghusen. The date 1570 is when the mayor Gotthard von Höveln took over the complex. The Alleyway was named after him. In 1792 all the buildings were renewed and the houses you can see today date back to that time. The door to the alleyway was open so I took the opportunity to walk inside and have a look around in the Höveln Alleyway. And of course I didn't hesitate to take some pictures of this picturesque little street as well. I had my lunch in Lübeck at restaurant Yachtzimmer. The location is quite convenient, over the bridge, across the street from the Holsentor. We were here quite early (12:00 in the afternoon) and seemed to be the first guests. But that wasn't a problem, we were served right away. About half an hour later lots of people started to come into the restaurant. So I was happy to be early and didn't have to wait long to be served. The interior is cosy, though not that spectacular. The service is good and the waiters were very friendly. So no complaints at all, except maybe that the food was a bit pricy. 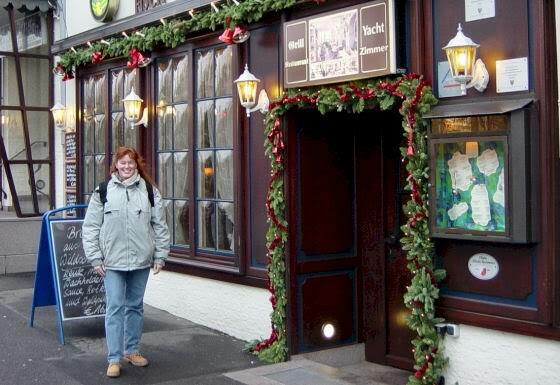 I think the best thing about the restaurant was having taste of one of the many German beers. As we were in Germany we of course wanted to taste one of the local beer. Duckstein was on tap in the restaurant, so that's the one we choose for. This beer is of course made according to the 'German Rheinheitsgebot'. This means that the beer is brewed solely of water, hop, malt and yeast. 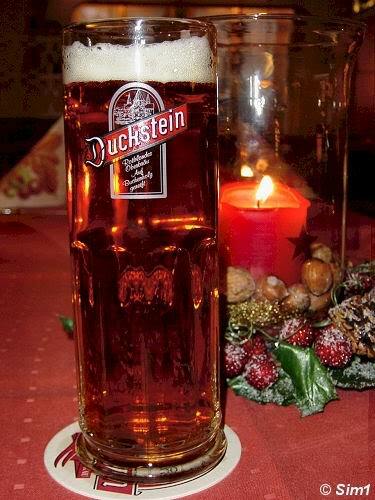 If you want to know more about this beer you can have a look at their website : http://www.duckstein.de/ (website is in German).